Jake Gyllenhaal Just Grows and Grows! With his new #1 box-office smash “Nightcrawler”, Jake Gyllenhaal shows anew that he is willing to take on the riskiest of roles and stretch his range, and the public’s perception of him as a screen actor and a leading man. Never comfortable with simply the role of a movie star/action hero, “Nightcrawler” shows us that he is becoming a very fine actor indeed. An actor’s actor.One of the best. His name stands for quality. Playing the slimiest of slime-balls, I don’t think we’ve ever seen so compelling a portrait of a bottom-feeder. His Louis Bloom is an ambulance chaser at best and simply a common thief, when we first see him in “Nightcrawler”. At the beginning of the film, which I saw at TIFF, he is seen stealing copper cables. He moves up the food chain from there, when he witnesses a car crash and sees TV video crews mercilessly filming the dying, bloody victims. He’s got a video camera, too, and thinks, “I can do that!” and does. And of course, as he pursues his new calling, things just get worse and worse. Rather his deeds do. And the chilling thing about “Nightcrawler” is that it is more or less absolutely true. This is how those tabloid news shows get their scammy footage. So this great LA noir just reverberates with TRUTH. Sadly. And Gyllenhaal’s massive weight loss for this character, mirrors the hungriness Bloom feels inside and out. And with the box-office bonanza this is turning out to be, the Academy can’t ignore Gyllenhaal’s frightening apt portrayal. People die and he keeps filming them. And selling his shocking, bloody footage to Renee Russo, who has never been better than she is here. As a local TV news manager, she is buying what Gyllenhaal is selling. She could reap her first Oscar nomination for this, too. In Supporting Actress, always a category, that this year more than ever is wide open. In his last several films, Gyllenhaal has shown an impressive range and daring. Even in the sci-fi mis-fire, “Enemy”, he took on TWO roles. An academic and an actor in Toronto. In “End of Watch”, he was a good cop whose good values and heart shown through every violent scene. “Nightcrawler” is just as violent as “End of Watch”, but is even more horrific because it shows, accurately, the ruthlessness of those profiting by exploiting that violence. 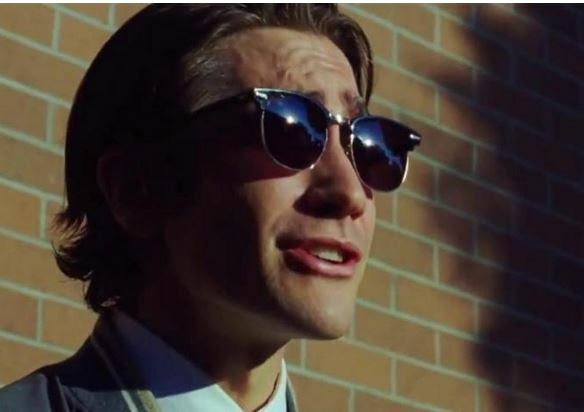 Jake the Great is turning out to be one of the best actors of his generation. He was nominated for an Oscar for Best Supporting Actor for his unforgettable, doomed cowboy in “Brokeback Mountain.” and his 360 degree turn into the despicable “Nightcrawler” could very well bring him back into the Awards race again. I certainly hope it does. He deserves to be there.